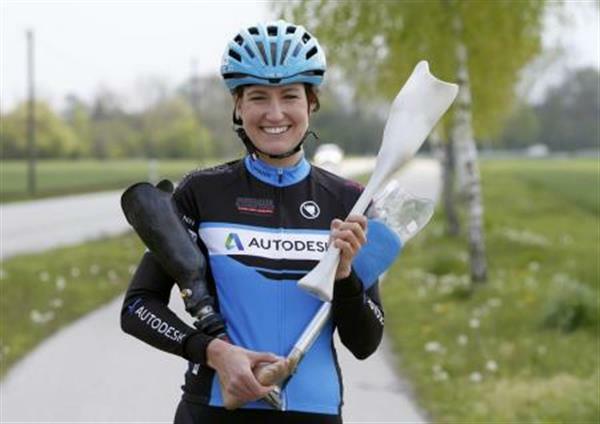 With the Summer Olympics and Paralympics fast approaching, German Paralympic cyclist Denise Schindler has teamed up with AutoDesk to develop a new 3D printed leg. Previously, Schindler had been using a prosthetic leg made of plaster, which was quite pricey and slower to manufacture. By 3D printing a replacement, Schindler hopes that it will reduce cost, speed up the process and focus more on comfort of the athlete. To create a prosthetic limb, AutoDesk takes a 3D scan of Schindler’s leg and digitally renders it. The technology is a cloud design tool that allows experts to create a digital model of the prosthesis and collaborate with stakeholders before physically printing it. According to SportTechie, Autodesk predicts that the timeline for printing will eventually take only five days, and cost only a quarter the price of alternative solutions. Schindler was a silver medalist at the 2012 London Paralympics and is hoping to contend for gold this summer in Brazil.